Enjoy a fun-filled getaway of a lifetime at the Curacao Resort, Spa & Casino. Located near Aruba and off the coast of Venezuela, the 38-mile long island of Curacao offers idyllic weather, exquisite beaches, spectacular snorkeling and much more to families, couples, singles and friends. 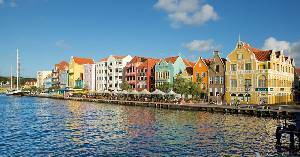 Not to mention the capital city of Willemstad was named one of the 'World's Most Colorful Cities' by Travel+Leisure! At the Curacao all guests will enjoy an Unlimited-Fun vacation where everything is included from endless domestic and international beverages and daily refreshed mini-bar, to limitless food and beverages and endless daily activities. Guests can enjoy the on-site dive center at the Curacao resort where they can catch a boat right at the resort to the National Underwater Park and enjoy diving and snorkeling at one of the most popular diving sites in the world. The 38-Mile Long Island Of Curaao Offers Idyllic Weather, Exquisite Beaches And Spectacular Snorkeling. Everything Is Included From Endless Domestic And International Beverages To Limitless Food And Endless Daily Activities. Prestigious RCI Gold Crown Resort Award Winner.